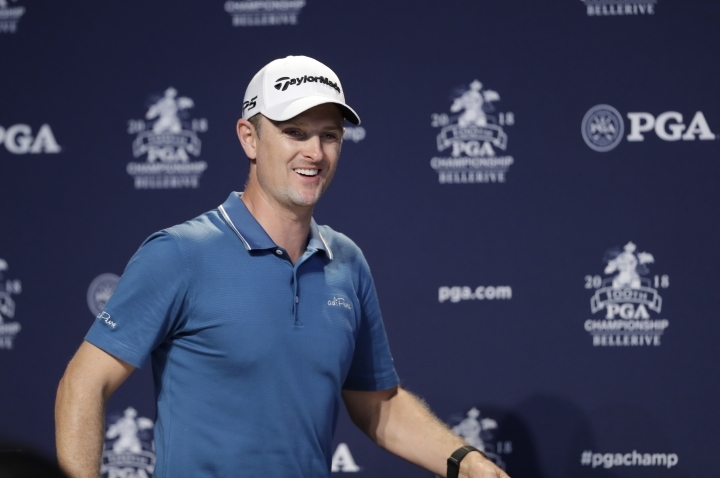 ST. LOUIS — Justin Rose skipped playing practice rounds for the PGA Championship, preferring instead to rest a sore back that forced him to withdraw from last week's WGC-Bridgestone Invitational. He walked each nine at Bellerive Country Club, though, and he thinks that's good enough. "The great thing is I haven't hit a bad shot in two days. So I'm coming in feeling pretty good about that," the world's third-ranked player said jokingly. "I just feel like walking it has been quite an interesting experience. ... I feel like I've actually got a clear vision of the golf course." "I have the time to look around a little more closely," he said. "I'm not dictated by where I've hit my ball, and then you kind of get concerned with that and those visuals." Rose admitted it's a different way to approach a major championship, but the winner of the 2013 U.S. Open at Shinnecock Hills has been in enough of those that he knows what to expect. He lost in a playoff to Sergio Garcia at the Masters last year, and twice he's been top 5 at the PGA. "I hit some balls today and felt absolutely fine and really comfortable with my swing and the way it's moving," he said. "It's been a slightly different preparation for me this week because of it, but I think it's all been about trying to get to Thursday and be ready for Thursday." 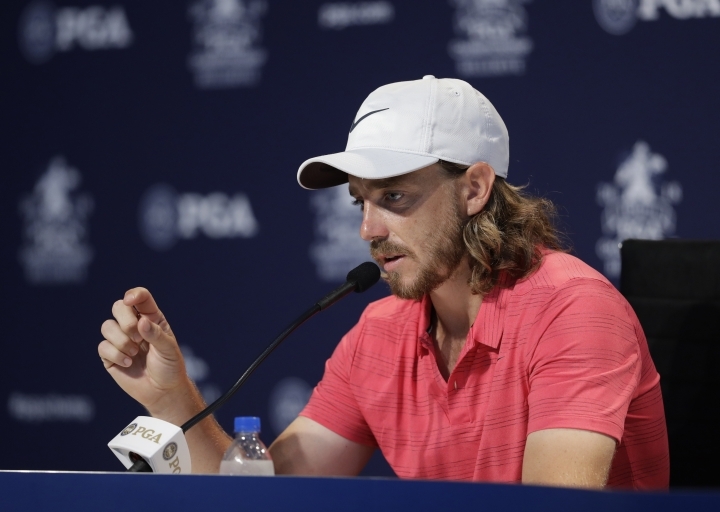 BANK ERROR IN YOUR FAVOR: Imagine Tommy Fleetwood's surprise upon checking his bank statement. Not England's Tommy Fleetwood, but rather Thomas Fleetwood, a club pro at Streamsong Resort in Florida. The Florida Fleetwood received a $154,000 payment that, it turns out, was the 12th-place money from the British Open that should have gone to the other Fleetwood. Thomas Fleetwood has competed in the European Senior Tour's qualifying school the past five years, and the European Tour, which executed the payment, had his bank information on file. The Fleetwood playing at Bellerive this week told Britain's Press Association he didn't know if he'd been paid "because I don't really look." But a friend of Florida's Fleetwood, Greg Thorner, posted a screenshot of his friend's bank account that showed the European Tour had paid the wrong man. "'I didn't believe him at first," Thorner told the Press Association, "but then I watched him log into his account and I was like, 'Holy crap.'" MAJOR JOY FOR CBS: The PGA Championship's move to May next season means CBS will broadcast three consecutive major championships — the network also is the longtime partner of the Masters. CBS Sports chairman Sean McManus praised the revamped schedule, calling it "good for the overall sport of golf. Good for the PGA. Really good for the fans and I think good for CBS, too." As it stands, this year's tournament starts less than three weeks after Francesco Molinari hoisted the Claret Jug following his British Open triumph at Carnoustie. WIZARD OF OZ: The PGA of America honored Hall of Famer Ozzie Smith on Wednesday for the work he's done with the Gateway Section of the PGA in making golf accessible to inner-city kids. Smith didn't pick up the game until retiring from the Cardinals in 1996. But he found it to be an ideal sport to teach young people discipline and self-confidence while keeping them out of trouble. "I realized that it was a great way for me to introduce kids in the inner city to something that I was not introduced to when I was a kid growing up in south central Los Angeles," he said.